Is That A Tablet In Your Pocket, or…? My problem with tablets is they don’t replace anything. My smartphone replaced a lot of things, my laptop replaced my desktop. My Kindle replaces lots of books. From what I see, tablets don’t replace anything. They are a new device joining the primal fight for airport power outlets. They do seem kind of fun. On planes I sometimes watch videos on my laptop, and it would be nice to have something smaller – the keyboard gets in the way. My smartphone can play videos, but that is too small. A tablet looks just right. Tablets, or at least the iPad, are clearly popular and people seem to love them. Apple is rumored to release the iPad 3 in time for holiday shopping. Feel free to get me one. The main thing holding me back is principle – I don’t like iTunes and refuse to get any more devices that require I install it (don’t tell me about the post PC era until a tablet doesn’t require one). Will the tablet replace the enterprise phone? In my recent post on the future of the phone, I ignored tablets. I don’t really know what to make of them yet. Jon Arnold seems pretty enamored with the Cius, but I don’t see why on the surface. I see potential based on business applications or processes, but right now my tools are more optimized for a smartphone or notebook. The Avaya Desktop Video Device with the Flare Experience is larger, nice full screen display – but the description won’t fit in the space on the purchase order form. I really like my Samsung smartphone and believe the Galaxy tab could nail it as a general purpose workhorse, but there’s a realistic chance Apple will shut down that business. If apps are not important, then the RIM Playbook or HP TouchPad could be the ticket. Cisco, Avaya, Samsung, RIM, HP, and Apple all believe the tablet is destined for the enterprise as a mobile video, email, application savvy, portable, communications thingy. For this to happen, it will take an ROI. Increased productivity could do it alone, but eliminating a device such as a desktop phone makes it a stupid easy justification. The big question is does it make sense? I see two major barriers. Easy to overcome. Coverage: Wireless devices suffer from coverage issues. 3G, 4G, wi-fi, whatever, same ol story. The answer is a wired connection as an option. Not widely supported for reasons I don’t get. Ethernet jacks are thicker than most tablets, so that means pigtail, X-Jack, or docking station. (anyone remember the X-Jack on PCMCIA modems?). Power and signal coverage are recurring problematic themes for wireless devices – a dock solves both. One lawsuit of an employee unable to dial 911 is all it takes. Kiosk mode is handy too. Desk phones can be used by anyone. Cell phones and tablets have so much personal information that a password is prudent. Cell phones allow 911 without a password, but an enterprise desk phone really should allow internal dialing without a password. There is also a form factor thing to consider. The tablet needs to be propped on the desk so the owner can see it (and show it off to everyone else). Accessories such as a handsets, keyboards, quality external speakers, and so on need to be available, but this area seems under control. These accessories need to be easily reallocated as needs change. Tablets are more breakable and easier to lose than a desktop phone. Probably should have an RFID chip installed, but that seems more reasonable as a customer added accessory. 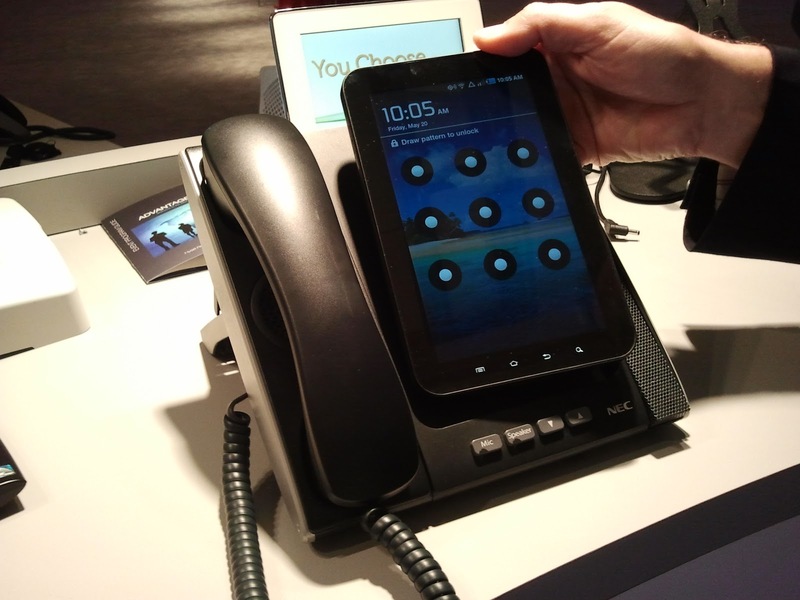 At the recent NEC Advantage conference, a proof of concept tablet docked phone was demonstrated that used a telephone base as a tablet dock. The phone could still receive calls without the tablet, but had no display or keypad in this mode. The tablet effectively runs the same soft phone client as one the desktop, NEC uses RIA technology so the porting of applications between devices is fairly simple. This is a great concept and I hope to see it come to market. Tablet makers would do themselves a favor if they could standardize on a basic dock connector, but don’t hold your breath. Kudos to companies that have figured out how to include the tablets with collaboration tools – such as shared PowerPoints and desktops. SEN and RADVISION have solutions on an iPad, very impressive. Love the fact on RADVISION I can control the deck. Avaya and Cisco have built this into their devices as well. Evidently Microsoft intends to address this market with Windows 8. That will be interesting – a mainstream OS that works on a desktop or tablet could be very powerful. Clearly an interesting space to watch, but for now I’m keeping my desktop phone.